The apparent promotion of these young candidates by party brass and sitting MPs (as noted previously), in addition to the involvement of a well-connected digital agency with clear and deep Conservative party ties, raises a number of questions. Were all of the Conservatives nominees in these ridings given equal access to the template and materials provided by Go Newclear, or only certain candidates (particularly the chosen and those deemed electable, ie. : young ones)? In my review of numerous websites of candidates from several different regions of the country, I have yet to find an older candidate who utilized the now familiar Go Newclear template. Is it just a coincidence that only certain young candidates seem to be utilizing the template provided? Does the apparent promotion of these young candidates, potentially at the expense of others, cross the line in terms of the fairness of the nomination process within Conservative constituencies? 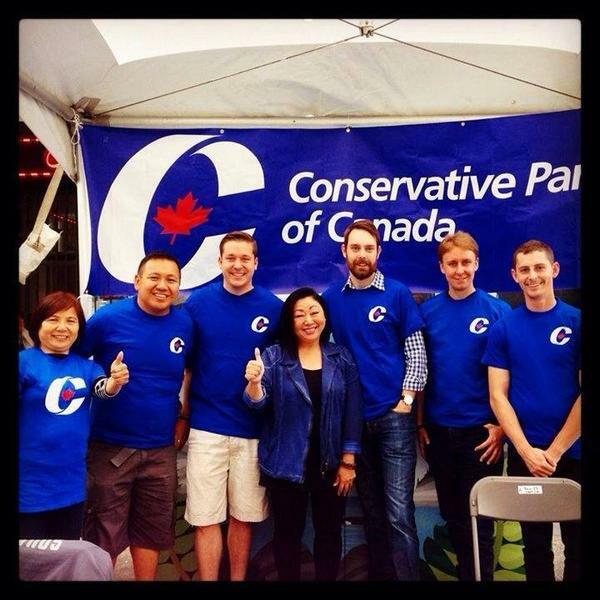 Does the support of these young candidates at the senior party level constitute meddling in the affairs of local Conservative constituencies and nomination races? 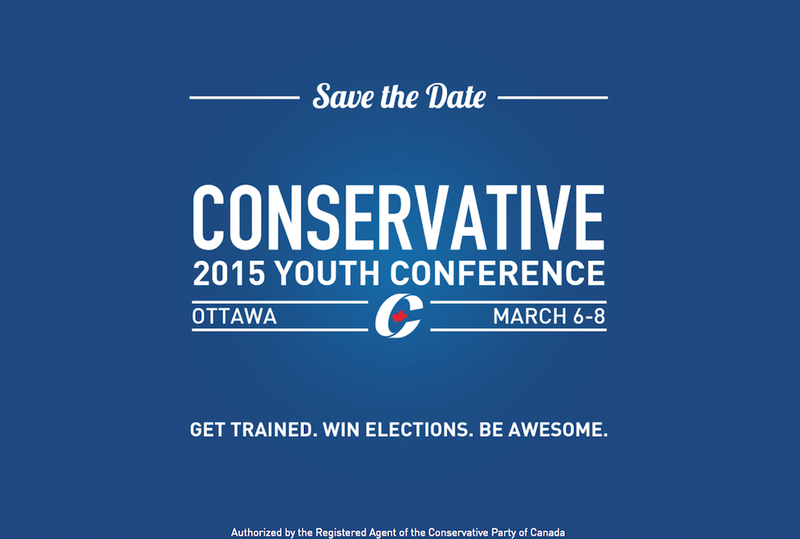 It should be noted that not all young Conservative candidates utilized the Go Newclear template. It is unclear whether they chose not to use it or were not offered it for use. Nevertheless, if I were a Conservative candidate running in any upcoming and/or future nominations, I would be very wary if I was running against a young candidate using the familiar Go Newclear template and brandishing endorsements from sitting MPs and party brass, as the chances that I would be winning the upcoming nomination would appear to be not be so good. Mr. Laidler, the young and dare-I-say handsome, articulate, and a veteran to boot! candidate in the riding of Port Moody-Coquitlam (pictured third from left) seems to be the poster boy for this new-found strategy, especially when one considers the AV club vibe from most of the rest of the candidates identified above. 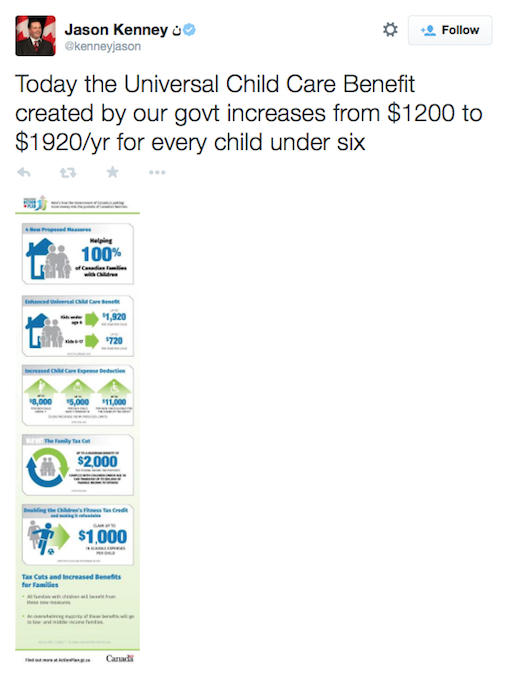 Consider again the recent numerous endorsements and the recent partisan promotion of Mr. Laidler on the public’s dime, etc., by party brass and you can see that they are clearly, actively promoting him. 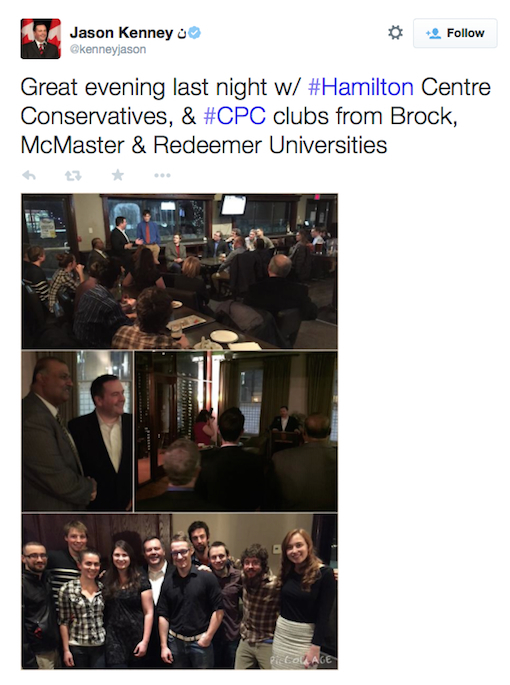 I suspect all these Conservative candidates will be part of a “New Conservative Generation” campaign of the sort that James Moore may have been slyly hinting at back in November. 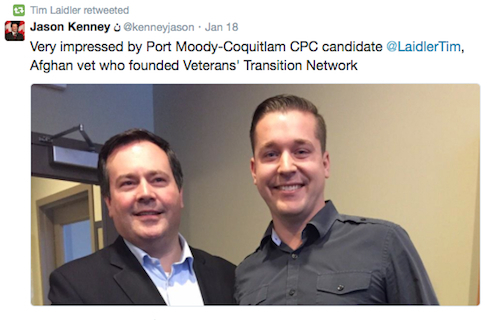 Turning back to the Conservative nomination race in my home riding of Port Moody-Coquitlam, I do wonder if the other candidates were aware of what was going on prior to the nomination meeting. By his own admission, Mr. Laidler only recently moved into the riding and has only a somewhat distant connection to it, having grown up in Anmore. But if Party sources were providing him with exclusive resources, did the other nominees ever have a realistic chance? Janine Davies, the popular head of the Chamber of Commerce, whom one would think would be a shoe-in for the Conservative nomination, was unsuccessful in her candidacy. Were she and the other impressive local nominees with significant local ties to the riding perceived by party brass and sitting MPs to be less of an asset than Mr. Laidler, and subtly (or not so subtly) pushed aside? Did she and the other candidates have the plain misfortune of seeking the nomination in a riding selected for one of “the chosen ones”? Are these young Conservative candidates the best the party has to put forward, or simply the ones who fit a narrowly preconceived cluster of criteria, established by party insiders? 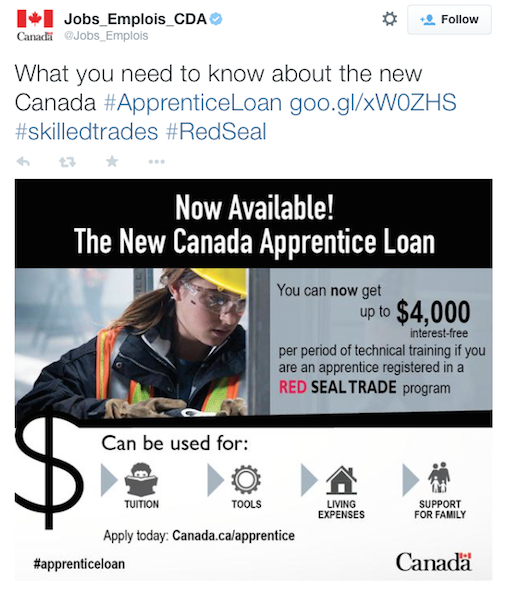 It could be argued that the recent Canada Apprenticeship Loan program is part of a calculated effort to court the youth vote too. Is this an updated 2015 appeal to the archetypal swing voter whom former Harper adviser Patrick Muttart used to call “Dougie”? 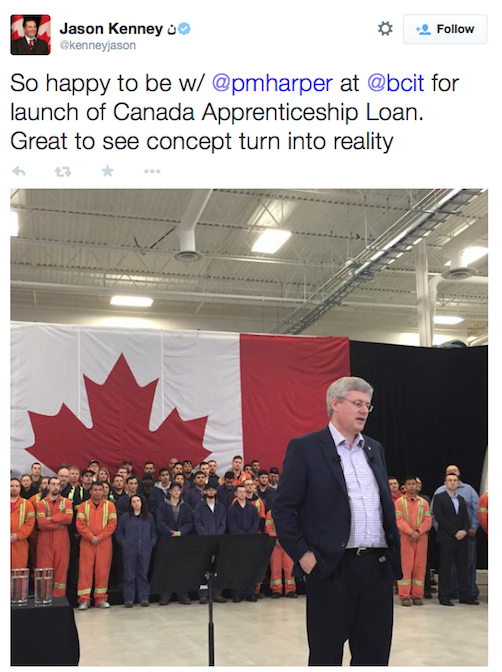 Is it just a coincidence that Prime Minister Harper has the flag and a large number of youthful workers as a backdrop? 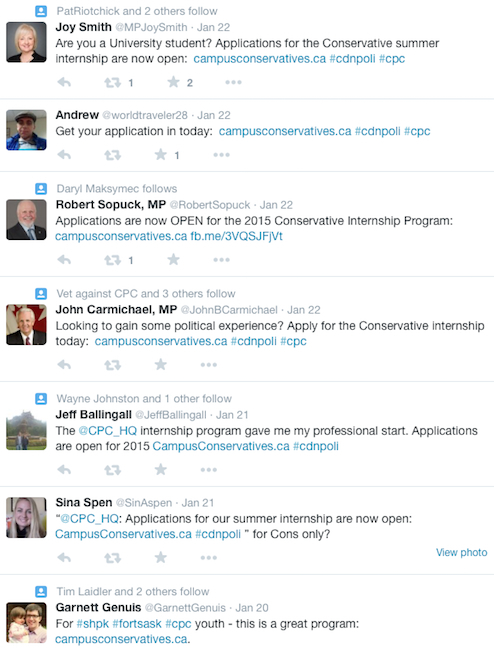 Then there’s the summer intern program for university students. 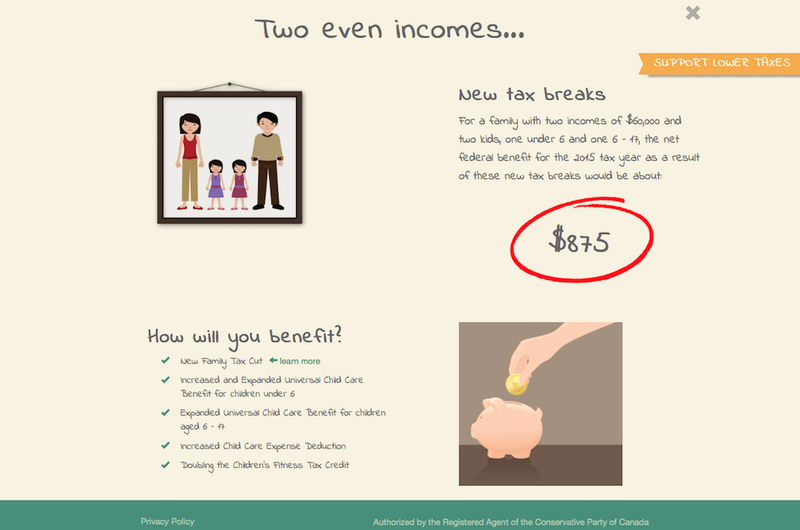 You could even argue that the recent tax cuts and increased child care benefits are also part of a larger strategy to appeal to youth: Who else has young children? Sensing a pattern yet? 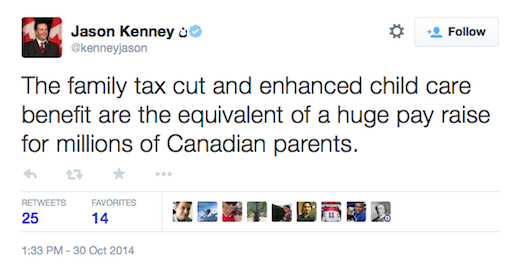 Note that Mr. Kenney’s name comes up constantly in association with these younger candidates and youth initiatives. I have chosen to focus on him and his social media accounts as he was arguably one of the main architects of the focused-engagement strategy during the last election. It seems to me a tell that he’s so active in youth matters. So, is this all so far-fetched? As noted, during the last election the Conservatives initiated a concerted effort to court the ethnic vote. Their thinking was that the base demographic for the Conservatives was getting older and, frankly, smaller year-by-year. Party brass came to the realization that they needed a new source of supporters in order to have a legitimate shot at a majority. Ethnic voters, who had long been considered largely Liberal and NDP supporters, were identified as one such source, and a strategy was developed to court them. 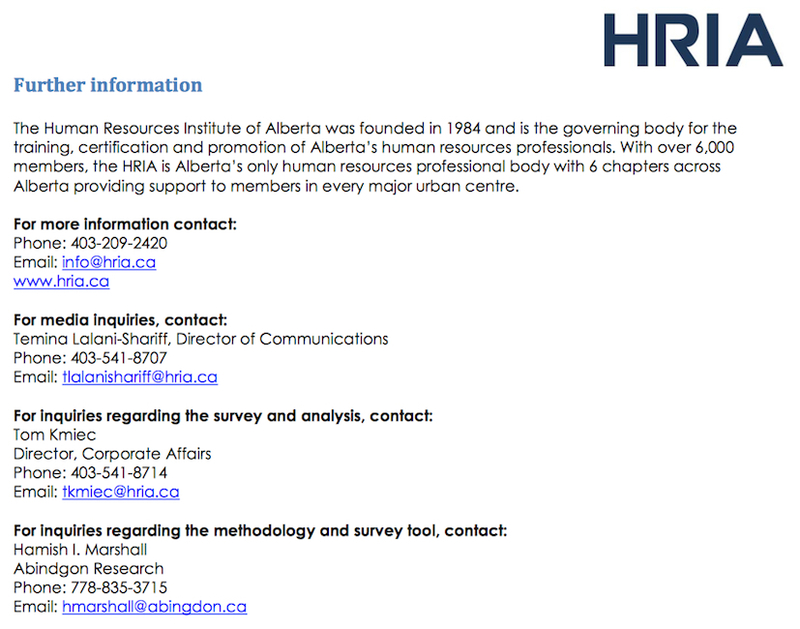 The initiative, which appears to have been largely led by Jason Kenney, was accompanied by directives and materials supplied by the higher echelons of the Conservative Party, including identification of ridings perceived to be ripe for the picking. The eventual result, as we are all aware, is that the Conservatives achieved a majority and with only 39% of the popular vote, in part as a result of their new-found success in targeted ridings. Fast forward to 2015 and a new dilemma has appeared. The Conservatives have now largely tapped-out the ethnic vote, their base is still getting older and smaller year-by-year, they are in trouble over the economy, and looking for a new source of votes in order to retain power. But where are they going to get them? As with ethnic voters in 2011, the answer may seem counterintuitive, but going after youth offers an opportunity for renewal and, as with the Republicans in the States, to put a new face on a tired old image. Whether they will be successful in attracting young voters remains to be seen, but that seems to be a clear part of the Conservative strategy for the upcoming election. Who are they trying to appeal to here?